No Colour Bar – Black British Art in Action 1960-1990 was one of the most comprehensive surveys of Black British art in recent years, featuring distinguished works of art rarely seen publicly. The pioneering art and archive exhibition ran from 2015 to 2017 at the Guildhall Art Gallery, London and on tour at Hackney Museum and the Black Cultural Archives in the UK. No Colour Bar: Black British Art in Action 1960 –1990, was one of the most comprehensive exhibitions of Black British art in recent years, with themes that examined the space for Black arts and cultural practices in Britain; the struggles against oppression and injustice; movements of resistance to and activism against racism, political violence and inequality; and the embracing of a new internationalism through solidarity, collaboration and creativity. The No Colour Bar publication contains artist profiles and reproductions of some of the key artworks that were featured in the Guildhall Art Gallery exhibition, and with its documentation of the narratives and responses from expert voices, the book has become one of the legacies of this ground-breaking exhibition and touring programme. With thought pieces by co-curators, Katherine Pearce, Makeda Coaston and Michael McMillan, the publication also has further important contributions from respected and expert cultural leaders and writers, including Eddie Chambers, Hamja Ashan, Margaret Andrews, Margaret Busby and Colin Prescod. 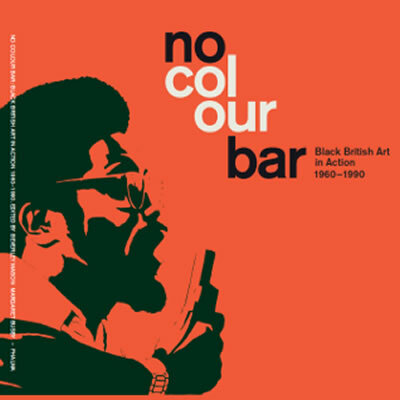 No Colour Bar: Black British Art in Action 1960 –1990 was a ground-breaking visual art and archive exhibition held at the Guildhall Art Gallery (10 July 2015 – 24 January 2016) with its digital touring version at Black Cultural Archives and Hackney Museum (September 2016 – January 2017). It was organised by the Friends of the Huntley Archives at the LMA, with generous support of its key partners, the City of London’s Guildhall Art Gallery and the London Metropolitan Archives with lottery funding from the Heritage Lottery Fund and other donations. Volunteers were instrumental in supporting the programme. All net proceeds from the sales of the legacy publication go towards the work of the charity: Friends of the Huntley Archives at the LMA (FHALMA). Charity number 1152314. There is no question that No Colour Bar will be remembered as a landmark exhibition about the historic conjecture of radical art-making and political activism in Britain from the 1960s to the 1990s. This sprawling and multi-sensory exhibition was ground-breaking in the way it effortlessly combined art works in all media (paintings, installation, video) with archival documentation drawn from the renowned Huntley archives...which revealed little known links and connections between aesthetics and politics in Britain’s black creative communities. In many previous shows, the activities of artists and activists have been largely shown separately, whereas the dialogue between the two staged in No Colour Bar stood out in the way that it allowed for a more holistic vision of Black British creativity, one that can inspire new generations who are eagerly searching for examples of how art and activism can coexist. The radical lives of Guyanese immigrants Eric and Jessica Huntley have inspired a ground-breaking exhibition. CNN's Jim Stenman reports. No Colour Bar shows us that the Black arts movement could simply be a better way of doing things. That is to say, where bridging of alliances of all oppressed groups and the poetic of demands for equality, organic to actual social movements rather than the biennalised 1% within the vacuum of the “universal” Liberal White art world, can effectively take place. This was an archival show with the fire of life, the air of authenticity and the buzz of a multi-generational community. Niru Ratnam’s 2010 attempt to restage remnants of Rasheed Araeen’s landmark show in A Missing History: ‘The Other Story’ Re-visited felt like a cold commercial enterprise in comparison. For this reason, this remained for me the most essential and inspiring exhibition of the year. The spirit of the Huntleys lives on. Ashan is an activist, artist and curator.